Rather surprisingly, Sri Lanka is a hub for Christmas cheer, offering a fantastic array of festive fun to get you in the holiday spirit. It is said that Christmas (or Naththala) was introduced to the island by the Portuguese, the Dutch and the British, who ruled the country at various stages over the centuries. Thanks to this, there are plenty of things to do at Christmas in Sri Lanka! Across the island, the annual yuletide celebrations begin early and on 1st December households head outside to set off firecrackers, marking the official countdown to the big day. From festive food to magical Christmas markets, we explore why you should spend Christmas in Sri Lanka in 2018. Swap the snow for the sun! 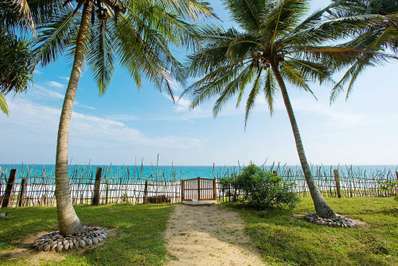 Celebrate Christmas in Sri Lanka in 2018, by heading to the Dalawella beach! Unlike much of the world, December is one of the best months to visit Sri Lanka, particularly if you’re planning on heading to the west and south coasts or Hill Country. Benefiting from perfect blue skies and an average daily temperature of 30 degrees Celsius, Sri Lanka invites you to leave your winter coat behind and pack your bikini for a festive season in the sun! Instead of spending your winter curled up by the fire, head to one of Sri Lanka’s gorgeous beaches for a Christmas Day to remember. On Unawatuna Beach in Galle, everyone heads to the sand on Christmas Eve for fireworks and dancing – the perfect way to see in the festive season. If you need more encouragement, take a look at the country’s most spectacular beaches, as featured in our dedicated guide! You may find it hard to believe, but Sri Lanka is famed for its festive Christmas Cake. Due to the country’s history with The Netherlands, Portugal, and Britain, the culinary heritage of this fair island has been heavily influenced by Europe. Available in every bakery and cafe on the run-up to the big day, Sri Lankan Christmas cakes are decorated with cashew nut marzipan and wrapped in red or green festive paper. The sticky treat features many of the ingredients found in the classic recipe, including mixed peel, brandy, and spices. We can’t think of a finer way to ring in the Christmas holidays in Sri Lanka, can you? No matter where you go on the island, Sri Lanka has plenty of incredible accommodation choices to make your Christmas break truly memorable. From private apartments in the heart of Colombo to luxury estates in Kandy and Hill Country, our selection of incredible pads will have all your friends green with envy. Imagine waking up not to icicles and Bucks Fizz, but to a heated outdoor pool and cocktails on tap – that would certainly be one incredible way to spend Christmas in Sri Lanka in 2018, don’t you think? The Christmas holidays in Sri Lanka really wouldn’t be complete without a trip to a traditional market. And lucky for us, festive shopping is big news in Colombo! The city opens itself up every year with a series of festive markets, where you can purchase everything from gifts to seasonal snacks. Galle Face Green Fair and Colombo Christmas Street are the best options the city has to offer. Decorated with fairy lights, flooded with festive music and home to the tallest Christmas tree in the world (a record achieved in 2016), the Galle Face Green Fair is a must for all retail lovers. The fair takes place the week before Christmas in the open area close to the city’s Fort, complete with games, stalls and plenty of festive cheer! Colombo Christmas Street transforms Colombo’s Green Path into a yuletide mecca, with gifts, carols, street performances and lots of edible treats! The city’s vibrant seasonal markets are definitely one of the best things to do at Christmas in Sri Lanka! During your visit to the city, stay in one of our truly luxurious villas or apartments, hand-selected for their location and elegance! Enjoy the beauty and magic of Midnight Mass. If you’re looking for tranquil things to do at Christmas in Sri Lanka, then add a Midnight Mass service to your list! Despite being a mainly Buddhist country, Sri Lanka is home to plenty of Christians, which means the annual Midnight Mass celebrations can be enjoyed while you’re away. Those wanting to attend an English service can visit the likes of St. Lucia’s Cathedral in Colombo. Starting at around 11.30pm on December 24th, the Midnight Mass service involves singing and prayers to candlelight, to celebrate the birth of Christ. If you prefer to attend a Mass in Sinhala, head to any church or cathedral across the country, and enjoy a truly memorable start to your Christmas Day. Just because you’re abroad, doesn’t mean you should miss out on a festive feast! A time for wining and dining, Christmas just wouldn’t be the same without a really special slap-up meal! Thankfully, across the island restaurants and hotels come to life during the winter months, with special events and dinners, usually accompanied by traditional dancing and fireworks. Taprobane in Colombo is renowned for its annual festival buffet, while Amangalla in Galle offers a traditional five-course set menu every Christmas Eve, where organic turkey and Christmas crackers are served alongside live orchestral music. So, if you’re looking for a classic way to spend the Christmas holidays in Sri Lanka, make sure you book yourself a festive feast to remember! Another amazing option would be to have a Christmas dinner prepared by the private chef in your holiday villa. Christmas mix of local and Western cuisine? That’s definitely a great idea! If you’re looking for a healthier way to spend Christmas in Sri Lanka in 2018, then why not book one of the country’s many yoga retreats? Start each morning with a sunrise yoga session on the beach, spend your afternoons lounging by the pool and sample nutritious local cuisine to make your festive season one for the body, mind and soul. Ulpotha offers fantastic retreats for all levels throughout the festive season. Located in the gorgeous foothills of the Galgiriyawa Mountains, this scenic village allows you to enjoy daily yoga sessions, massage treatments and incredible cuisine, while soaking up the tranquil atmosphere of Embogama. True festive bliss! If you’re still not sold, why not take a look at 10 unique spots that will have you booking your flights!